As mentioned before, Malaysia has one of the tallest native rainforest tree (88m) in the world called the Tualang tree. Its scientific name is [Kingdom: Plantae, Division: Magnoliophyta, Class: Magnoliopsida, Order: Fabales, Family: Fabaceae, Genus: Koompassia, Species: K. excelsa]. It has large spreading roots and slippery trunk. Giant honey bees like to nest there. One tree native to Malaysia is the Angsana tree. Its scientific name is [Kingdom: Plantae, Division: Magnoliophyta, Class: Magnoliopsida, Order: Fabales, Family: Fabaceae, Subfamily: Faboideae, Tribe: Dalbergieae, Genus: Pterocarpus, Species: P. indicus]. The trunk is a reddish hardwood which is termite resistant and has a scent like rose. Because of this, it can be used to produce natural red dye, made into furniture and fragrant. Its flower is yellow in colour, about 1.5 cm and blooms in Apr. Oil Palm Trees are cultivated for its fruit that is used to produce palm oil. Malaysia is the largest producer and exporter of palm oil but is going to be overtaken by Indonesia. Its scientific name is [Kingdom: Plantae, (unranked): Angiosperms, (unranked): Monocots, (unranked): Commelinids, Order: Arecales, Family: Arecaceae, Subfamily: Arecoideae, Tribe: Cocoeae, Genus: Elaeis Species: guineensis]. This tree can grow to about 20m tall with pinnate leaves. It will start to bear fruit about 30 months after planting with good care. It is a non-seasonal fruit and takes about 5-6 months to mature after pollination. History : In 1848, the Dutch brought seeds from Africa to Bogor Botanical Garden in West Jawa thus introducing Oil Palm to Southeast Asia. Then in 1870s, the Dutch brought this oil palm tree over as an ornamental plant. By 1909, it has became a garden plants and experimental plantation was started in Batu Tiga, Selangor. The first commercial plantation began in Kuala Selangor in 1917. In 1995, Malaysia became the largest producer of palm oil. Its contribution : It supports nearly 200,000 families like the independent small holder and government land scheme people in plantation. Malaysia has about 271 palm oil mills, 41 refineries and 13 oleo chemical plants. However, workers in such processing and manufacturing countries are foreigners. Its uses : Both crude palm oil (CPO) from fruit flesh / mesocarp and palm kernel oil (PKO) from endosperm / kernel can be edible. However, the mesocarp is mainly used as cooking oil where else the kernel oil is used in processed food. The leftover kernel meal can be used to feed livestock. Edible palm oil is used as cooking oil, margarine, condense milk and powder milk. The non-edible is used as diesel substitute, ingredient to make soap and in the production of PVC, gum, candles, lubricating grease and as ingredients for plastifier. Rubber Trees are cultivated for its latex. It was the most important 'planted produce' of Malaysia. Malaysia is the 3rd biggest producer of rubber after Indonesia and Thailand. The scientific name for Malaysia's rubber tree is [Kingdom: Plantae, Division: Magnoliophyta, Class: Magnoliopsida, Order: Malpighiales, Family: Euphorbiaceae, Subfamily: Crotonoideae, Tribe: Micrandreae, Subtribe: Heveinae, Genus: Hevea, Species: brasiliensis]. This tree grows well in well drained clay soil and can grow to about 25m. History : Rubber tree planting was initiated by British administrator in India. In 1870s, Sir Henry Wickham went to Brazil's Amazon rainforest to collect about 70,000 rubber seeds and took them to Kew Garden in London to germinate. In 1876, 9 of the seedlings were planted in Kuala Kangsar, Perak by H.N Ridley. Due to invention of tyres, rubber planting industry grew and by 1930s, Malaysia's rubber industry overtook Brazil's. Its contribution : Before the introduction of synthetic rubber, rubber was the most important planted resource in Malaysia. Now, its price is not as good as palm oil's price and it has competition from synthetic materials. However, it is still widely planted in Malaysia but slowly being replaced by oil palm. Its uses : Rubber is being tapped, usually about 4am to 7am for its latex. This latex will then have to be processed into raw rubber sheets before being exported to make medical gloves, band, stamp, boot of safety shoes and condoms. The trunk of the tree can be made into furniture and charcoals. Tea Trees are cultivated and always trimmed to get new fresh leaves. It The scientific name for the tea tree in Malaysia is [Kingdom: Plantae, Division: , Class: , Order: , Family: , Subfamily: , Tribe: , Subtribe: , Genus: Camelia, Species: sinensis]. This tree grows well in cool weather, the higher the altitude the better the quality of the tea. Tea leaves are plucked about every 3 weeks when new shoots flush. Plucked leaves will go through a process called withering process which will take overnight where dry air is blown to reduce the moisture content by 40%-50%. This will stimulate natural chemical reaction within the leaves. The 2nd stage is the rolling process where the rolling machines twist and break the leaves to expose the juice for fermentation. The 3rd stage or the fermentation process is actually an oxidation process to expose the enzymes to oxygen. This is a critical stage which takes about 1.5 hrs to 2 hrs for the leaves to turn from fresh green colour to copper colour. This is the critical stage because this is when the leaves develop its flavour. The 4th stage called the drying process stops fermentation and reduces the moisture to 3% by blowing hot air at about 100oC. This process crystallises the enzymes and takes about 20 minutes. The 5th and last stage is the sorting process whereby bigger leaves are separated from smaller leaves. There are 4 grades main grades. They are leaf where the whole leaves are intact, broken where the leaves are broken, fanning which are small broken leaves and dust which are very small broken leaves used in tea bags. Tea from trees in high altitude land where the climate is cold, with lots of rain and and well drained soil gives good flavour and aroma. Tea from trees in lowland where the weather is warm, with lots of rain and fertile acidic soil with good drainage produces strong and thick tea. In Malaysia, there are a few plantations that cultivate tea trees. The most well known is BOH tea plantation which has a few plantation areas that produce different quality / grade of tea. They are Sungai Palas Tea Garden near Mount Brinchang, Fairlie Tea Garden and Boh Tea Garden near Tanah Rata, Cameron Highlands and Bukit Cheeding in Selangor. Others are Bharat tea plantation and Cameron Valley tea plantation. Pitcher plant Its scientific name is [Kingdom: Plantae, Division: Magnoliophyta, Class: Magnoliopsida, Order: Caryophyllales, Family: Nepenthaceae, Genus: Nepenthes]. Actually, pitcher plant can be found in many places in Malaysia, even in Penang. My parents said pitcher plant can be seen around botanical garden hillside and currently, I have one in a small pot at home. Now, 09-Nov-2009, the plant is growing 2 cups. I took photos of them every 2-3 days once. I will put them into rotating photos in the future. Anyway, there is one special pitcher plant in Malaysia called the Nepenthes rajah which is the biggest pitcher plant in the world where its cup can hold up to 3.5 litres of water. This pitcher plant is endemic to Borneo or more specific Mount Kinabalu at the ultramafic soil region. There are about 30 species of Nepenthes in Borneo and Mount Kinabalu has 10 species with at least 3 species found no where in the world. Another is Nepenthes villosa. However, it seems that Nepenthes rajah can now be cultivated and is now widespread. The flowers given here are flowers that are commonly grown or cultivated for commercial purposes except Rafflesia. Rafflesia is the flowering plant that blooms the biggest flower in the world. One of the most outstanding feature about this plant is that it has no stems, no leaves, no true roots and only one very big flower. Rafflesia is parasitic, has only one seed and can germinate only if lodged itself in Tetrastigma vine. Instead of roots, it uses thin filaments like thread to penetrate into the vines of Tetrastigma. The Rafflesia flower blooms for about 5-7 days only and is unisexual. Therefore, for it to pollinate, many flowers have to open at the same time and near each other so that it will have better chance of being pollinated usually by flies. However, Rafflesia takes at least 9 month to for its flower bud to mature into a flower and is rare. Many are known to be near extinct. Rafflesia has 5 petals and when full bloom, it emits a foul adour. Its scientific name is [Kingdom: Plantae, Division: Magnoliophyta, Class: Magnoliopsida, Order: Malpighiales, Family: Rafflesiaceae, Genus: Rafflesia]. Different species may be endemic to certain areas. For example, the Rafflesia tuan-mudae is endemic to Sarawak especially around Mount Gading. A typical tuan-mudae has a diameter of about 60 cm. Other species found in Sarawak are Rafflesia arnoldii, the biggest Rafflesia measuring 97 cm and Rafflesia pricei. Sabah also has 3 species of Rafflesia. They are Rafflesia keithii, Rafflesia pricei and Rafflesia tengku-adlinii which was discovered on Mount Trus Madi in year 1987. Rafflesia is also known as Stinking Corpse Lily or Devil's Betel Box or Bunga Pakma. Malaysia has 7-8 species of this flower which can be found mainly in Borneo and some areas in Peninsula Malaysia such as the National Park and Royal Belum Forest in Perak. Hibiscus is Malaysia's national flower. Hibiscus has 5 petals which represents the 5 pillars of Malaysia stated in the Rukun Negara. Its scientific name is [Kingdom: Plantae, (unranked): Angiosperms, (unranked): Eudicots, (unranked): Rosids, Order: Malvales, Family: Malvaceae, Subfamily: Malvoideae, Tribe: Hibisceae, Genus: Hibiscus, Species: H. rosa-sinensis]. Some Hibiscus plants grow Hibiscus flowers of different colours such as pinkish-white and whitish-orange. The red coloured Hibiscus is the Malaysia's National Flower. It originated from China and belongs to the cotton family. The flower can last for about 2 days only. It is used in medicine, cosmetics and dyeing the hair. Bougainvillea spectabilis or Bunga kertas in Malay language is originated in South America and was named after a French sea captain called Louis Antoine de Bougainvillea. Its scientific name is [Kingdom: Plantae, Division: Magnoliophyta, Class: Magnoliopsida, Order: Caryophyllales, Family: Nyctaginaceae, Genus: Bougainvillea]. Different Bougainvillea trees can grow flowers in different colours like fuchia, white, pink, whitish-orange, etc. Ixora is called Jejarum in Malay language because it looks like needle (jarum in Malay language). Its scientific name is [Kingdom: Plantae, (unranked): Angiosperms, (unranked): Eudicots, (unranked): Asterids, Order: Gentianales, Family: Rubiaceae, Genus: Ixora]. Ixora originated in Asia-Pacific and make good hedges. The colour of the flower is mainly red but yellow flowers can be found too. Rose is the universal flower of rose and like cool climate. Therefore, Rose is cultivated mostly in Cameron Highlands. Its scientific name is [Kingdom: Plantae, Division: Magnoliophyta, Class: Magnoliopsida, Order: Rosales, Family: Rosaceae, Subfamily: Rosoideae, Genus: Rosa]. Frangipani (Bunga Kubur in Malay language) trees are mostly planted in graveyard in Malaysia. Its scientific name is [Kingdom: Plantae, (unranked): Angiosperms, (unranked): Eudicots, (unranked): Asterids, Order: Gentianales, Family: Apocynaceae, Subfamily: Rauvolfioideae, Tribe: Plumerieae, Genus: Plumeria]. The frangipani trees has flowers of different colours mostly white with centre yellow. Touch-me-not is an undershrub looks like grass, wild plant and prickly. Its scientific name is [Kingdom: Plantae, Division: Magnoliophyta, Class: Magnoliopsida, Order: Fabales, Family: Fabaceae, Subfamily: Mimosoideae, Genus: Mimosa, Species: M. pudica]. Its leaves will fold together when touched. Touch-me-not is native in tropical America. The locals called it Semalu meaning shy. Malaysia has many other trees native to Malaysia. Some of them that bear edible fruits are the durian tree, rambutan tree, langsat tree, salak tree, cempedak tree and nutmeg tree. These fruits have commercial value. So, they are also cultivated in orchards to produce them for sale. Most of the fruits below are native trees. However, there are other trees that are not native to Malaysia but cultivated here. Some of them are papaya tree and pineapple tree. 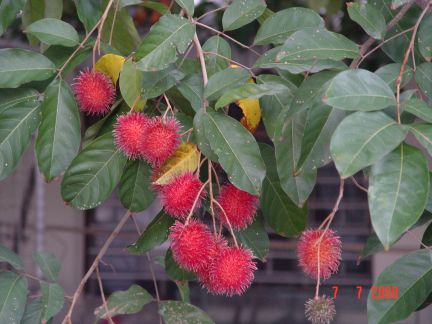 Cultivation made people of Malaysia thought that these plants / fruits are native to Malaysia. It seems that many native fruits in Malaysia are seasonal though not all the same season. Maybe that was why Malaysia started to cultivate many other fruits such as guava, pineapple, papaya, starfruit and many others so that Malaysians can get to eat fruits throughout the year. Durian is also know as 'King of Fruits'. Its scientific name is [Kingdom: Plantae, (unranked): Angiosperms, (unranked): Eudicots, (unranked): Rosids, Order: Malvales, Family: Malvaceae, Genus: Durio, Species: zibethinus]. This plant is native to Malaysia. Durian tree can grow until 40m tall and is grown from seeds. It will bear fruit after 7 years and takes 3 months to ripe. The 'shell' has large green thorns but the fruit inside is soft. It has high food value. This fruit, if not taken fresh but processed, it is usually made into lampok (durian cake preserved with sugar), dodol and tempoyak (added with salt and prawn paste). Durian is a seasonal fruit and can be found mostly during Dec-Feb or Jun-Aug.
Malaysian durians are allowed to ripe and drop down on their own. This does not make the fruit too ripe but just nice to be consumed. Thai durians are cut from the tree and left to ripe like most fruits that we eat. Durian is said to be 'heaty'. It gives a feeling like drinking alcohol drinks such as brandy and whiskey but much milder. To get rid of this heatiness, pour water into its empty shell, added some table salt into it and then drink it. Rambutan's scientific name is [Kingdom: Plantae (unranked): Angiosperms, (unranked): Eudicots, (unranked): Rosids, Order: Sapindales, Family: Sapindaceae, Genus: Nephelium, Species: N. lappaceum]. This plant is native to Malaysia. The rambutan tree can grow up to 20 m tall. It starts to bear fruits at 5 to 6 years, twice a year. When ripe, its shell is red in colour. It has 'hair' growing all round from its shell and this is where it got its name. 'Rambut' in malay means hair. Rambutan is a seasonal fruit and its main season is between June to September, following the durian season. Mostly grown in Kelantan, Johore, Terengganu, Pahang and others. It can be made into canned fruits. Langsat's scientific name is [Kingdom: Plantae, (unranked): Angiosperms, (unranked): Eudicots, (unranked): Rosids, Order: Sapindales, Family: Meliaceae, Genus: Lansium, Species: L. domesticum]. The langsat plant is native to Malaysia. This is a seasonal fruit. Cempedak's scientific name is [Kingdom: Plantae, Division: Magnoliophyta, Class: Magnoliopsida, Order: Rosales, Family: Moraceae, Genus: Artocarpus, Species: A. champeden]. The cempedak plant is native to Malaysia. This is a seasonal fruit usually after durian season. Salak's scientific name is [Kingdom: Plantae, (unranked): Angiosperms, (unranked): Monocots, (unranked): Commelinids, Order: Arecales, Family: Arecaceae, Genus: Salacca, Species: S. zalacca]. The salak plant is native to Malaysia. short-stemmed palm, with leaves up to 6m long; each leaf has a 2m long petiole with spines up to 15cm long, and numerous leaflets. The fruit grow in clusters at the base of the palm, and are also known as snake fruit due to the reddish-brown scaly skin. Banana plant is not a tree as its stem is actually a pseudostem. Its scientific name is Kingdom: Plantae, Family: Musaceae, Genus: Musa]. Banana is native to South East Asia and therefore Malaysia. The fruit grow in hanging clusters called a bunch/stem, with 3–15 tiers or 'hands' to a bunch and about 5-15 fruits or 'fingers' to a 'hand'. Each fruit is a banana or 'finger'. The female flowers produce the actual fruit without requiring . Mangosteen is native to the Malay Archipelago. Its scientific name is [Kingdom: Plantae, Division: Magnoliophyta, Class: Magnoliopsida, Order: Malpighiales, Family: Clusiaceae, Genus: Garcinia, Species: G. mangostana]. Mangosteen is known as the fruit that never tell lies. This is because mangosteen has a few woody lobes at the bottom of its shell. The number of lobes will correspond with the number of segments inside its purple shell. It is a seasonal fruit following the durian season. It is believed to have "cooling" properties. This makes mangosteen a very suitable fruit to eat together with durian. Mangosteen is also called 'Queen of fruits'. It was said that Queen Victoria liked to eat this fruit and offered reward to people whho could send fresh mangosteens to her. Mangosteen It is considered one of a 'superfruits'. Wax Apple or Jambu Air is native to the Malay Archipelago. Its scientific name is [Kingdom: Plantae, (unranked): Angiosperms, (unranked): Eudicots, (unranked): Rosids, Order: Myrtales, Family: Myrtaceae, Genus: Syzygium, Species: samarangense]. Wax Apple is a bell-shaped fruit, about 8 cm long. Its tree can grow to about 12 m high with leaves about 10-25 cm long and 5-10 cm wide. It is non-seasonal and its flesh is looser like watermelon. Usually, the reddest colour is the sweetest. The bottom part of a good wax apple is closed because if it is opened, there may have worm eggs inside. Cultivated fruit trees/plants in Malaysia. Coconut's origin is controversial. Its scientific name is [Kingdom: Plantae, (unranked): Angiosperms, (unranked): Monocots, (unranked): Commelinids, Order: Arecales, Family: Arecaceae, Subfamily: Arecoideae, Tribe: Cocoeae, Genus: Cocos, Species: C. nucifera]. Coconut palm tree can live on sandy soils and can tolerate high salinity. It prefers high rainfall and hot temperate, therefore mostly found in tropical coastland throughout the world. Guava is native mainly to the Mexico, Central and South America. Its scientific name is [Kingdom: Plantae, Division: Magnoliophyta, Class: Magnoliopsida, Subclass: Rosidae, Order: Myrtales, Family: Myrtaceae, Subfamily: Myrtoideae, Tribe: Myrteae, Genus: Psidium, Species: guajava]. Guava is called jambu batu in Malay lnguage. Guava is said as 'superfruits' bacause it is rich in vitamins A and C, containing over four times the amount of vitamin C as a single orange. It contains both carotenoids and polyphenols. Guava's seed has omega-3 and omega-6 polyunsaturated fatty acids. Papaya is native to the Americas. Its scientific name is [Kingdom: Plantae, (unranked): Angiosperms, (unranked): Eudicots, (unranked): Rosids, Order: Brassicales, Family: Caricaceae, Genus: Carica, Species: C. papaya]. Papaya is sometimes called 'paw paw' but the North American pawpaw is of a different Genus called Asimina. However, papaya is known to release a latex fluid when not quite ripe which can cause irritation and allergic reaction in some people. Pineapple is native to the southern part of Brazil and Paraguay. Its scientific name is [Kingdom: Plantae, (unranked): Angiosperms, (unranked): Monocots, (unranked): Commelinids, Order: Poales, Family: Bromeliaceae, Subfamily: Bromelioideae, Genus: Ananas, Species: A. comosus]. Pineapple is a herbaceous perennial plant that grows to 1.0 to 1.5 metres tall and is an example of a multiple fruit. Those with Hemophilia or with kidney or liver disease should not eat this fruit because it may reduce the time taken to coagulate a consumer's blood. It contains a proteolytic enzyme bromelain which breaks down protein. Starfruit is native to Indonesia, Sri Lanka and India. Its scientific name is [Averrhoa carambola]. Starfruit is a 'superfruits' because it is rich in antioxidants and vitamin C, and low in sugar, sodium and acid. However, starfruit contains oxalic acid which can be harmful to individuals suffering from kidney failure. Watermelon is native to southern Africa. Its scientific name is [Kingdom: Plantae, Division: Magnoliophyta, Class: Magnoliopsida, Order: Cucurbitales, Family: Cucurbitaceae, Genus: Citrullus, Species: C. lanatus]. Watermelon is 92% water, mildly diuretic, with red flesh that is a significant source of lycopene. It has many varieties. Cocoa is native to South America around Mexico, Amazon Basin and Andes. Its scientific name is [Kingdom: Plantae, (unranked): Angiosperms, (unranked): Eudicots, (unranked): Rosids, Order: Malvales, Family: Malvaceae, Genus: Theobroma, Species: cacao]. In Greek, Theobroma cacao means 'food of the gods'. Cocoa was introduced into Southeast Asia in the 17th century by the Spanish who brought it to Philippines (1670). Cocoa fruit is different from the above fruits in the sense that it is never eaten raw (not in Malaysia, at least) but processed first before consumed. Even in its native land 500 years, the Mayas and Aztecs also made it into a beverage. Cocoa pod or fruit is harvested when its colour turned fully yellow or orange. It will be splitted to get its cocoa beans after keeping the pods for about a week. Wet cocoa beans will be fermented for 5 days to get the chocolate flavour. On 6th day, the beans will be dried to get its moisture content to about 7% to develop better flavour. The dried cocoa beans will either be sold or will be processed further by roasting them. Roasting made them less acidic and improve flavour. I guess this is why chocolate is 'heaty' and I cannot take chocolate everyday, even just a small slice. Nutmeg's scientific name is [Kingdom: Plantae, (unranked): Angiosperms, (unranked): Magnoliids, Order: Magnoliales, Family: Myristicaceae, Genus: Myristica]. The nutmeg plant is native mainly to Indonesia. There are two spices derived from it, nutmeg and mace. It can be turned into other products like essential oil, drinks, medication, taste/frangrance, spice. Other spices usually used in Malaysia's cuisines are star anise, clove and cinnamon. There are other spices that are mixed to make into spice paste called rempah in Malay language.This rempah will then be used to cook curry.